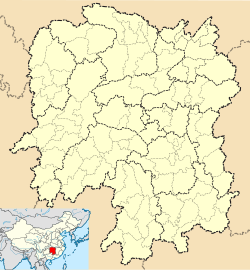 Linxiang (simplified Chinese: 临湘; traditional Chinese: 臨湘; pinyin: Línxiāng) is a county-level city in Hunan province, China, it is under the administration of the prefecture-level city of Yueyang. The city is located on the northeastern margin of the province and on the southeastern (right) bank of the Yangtze River, it is to the east of the city proper of Yueyang. Linxiang is bordered to the northwest and the north across the Yangtze by Jianli County and Honghu City of Hubei, to the east by Chibi City, Chongyang and Tongcheng Counties of Hubei, to the south and southwest by Yueyang County, to the west by Yunxi District. It covers an area of 1,718 km2 (663 sq mi), as of 2015, it had a registered population of 537,500. The city has 3 subdistricts and 10 towns under its jurisdiction. the government seat is Chang'an (长安街道). After an adjustment of township-level administrative divisions of Linxiang on 24 November 2015, Linxiang has 3 subdistricts and 10 towns under its jurisdiction. This Hunan location article is a stub. You can help Wikipedia by expanding it.